To me, mainstreaming Reiki means joining other practitioners in bringing the Reiki experience out of the treatment room and into everyday life. The idea of energy healing has become more familiar as a result, and the timing couldn’t be better for reaching out to our own communities. The possibilities are everywhere, every day. People are often intrigued but eager to receive some simple relief from their stresses. It can be as direct as holding someone’s hand at a hospital bed, or touching an elderly relative’s shoulder. Offering a peaceful Reiki moment to an animal is noninvasive and often hands-free, and therefore possible almost anywhere. I’ve volunteered Reiki at a community college, in an adult day care program, at my town’s community center, the Culinary Institute of America, a conference at a VA medical center, a dairy farm, a housing project, a cancer conference, under a tree in a park (with tables), a beauty salon, a chemotherapy infusion suite, in animal shelters and rescues (with animals caged and loose), and in an ICU. 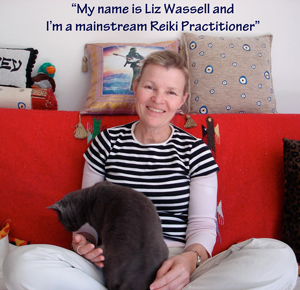 Find fellow practitioners, do Reiki shares, and start to dream together. Sign up for health fairs and bring tables. Maybe look for a free space to set up tables on a regular basis, then spread the word and see who becomes a “regular” over time. Start small. Grow gradually. And keep your Reiki share going – you and your fellow practitioners will appreciate it! There are no limits for providing Reiki services, it seems. The need for stress relief and healing is all around us, and those who experience Reiki’s calming gifts will be quite grateful. I believe you can find fertile ground wherever you happen to find yourself, in your family or community, or both.